Despite its remarkable breadth in content and tone, The Early Adventures range has been incredibly adept at evoking the sense and stylings of the 1960s era of Doctor Who, its lightly narrated plays perfectly keeping the First and Second Doctors in the public consciousness. Deftly continuing that trend with another Second Doctor tale featuring Polly, Ben, and Jamie alongside him, ‘The Morton Legacy’ offers a loving pastiche of Victorian London as the intrepid group of travelers must find the whereabouts of the missing TARDIS as a series of mysterious murders mounts. Writer Justin Richards is, of course, intimately familiar with Victorian times due to his stories in Jago and Litefoot among others, and ‘The Morton Legacy’ makes the most of the confines of this society to create a riveting and atmosphere-laden mystery. Indeed, the story starts simply enough as the titular Josiah Morton finds the TARDIS sitting on a street corner and takes it to display in his museum, one that is closed until a court case regarding a contested will is resolved. However, when that other claimant is found dead and all eyes settle upon Mr Morton as the likely culprit, the Doctor and his friends must discover the truth and prove Mr Morton’s innocence if they ever hope to find the TARDIS again. The Victorian era is a favourite haunt of Doctor Who, but it’s still quite fascinating to see this particular incarnation of the Doctor and his companions who come from either side of this particular time within its context. While this is certainly not a dark look at the underbelly of society and politics at the time, neither does it shy away from at least superficial looks at the court systems and social classes and hierarchy that were then present. Of course, the story never really goes out of its way to suggest that Morton is, in fact, guilty, instead mostly writing him as an unfortunate scapegoat of convenience, but Richards is still able to create plenty of mystery even without the central figure squarely under the Doctor’s suspicion as he plays upon listeners’ assumptions and offers a stunningly and surprisingly straightforward resolution after several figures and a mysterious artefact from Mr Morton’s collection gain prominence. Taken by itself, ‘The Morton Legacy’ is a simple adventure through Victorian tropes that makes the most of its atmosphere and entertains from beginning to end, serving as a reminder even to the Doctor to never assume anything and overlook the simple explanation. What it lacks in providing depth of exploration of its society, though, it makes up for with sterling characterization and interplay between characters, both leads and guests, as the mystery winds toward its ingenious but satisfying simple end. At this point it hardly needs saying, but Elliot Chapman has clearly mastered the voice and mannerisms of Ben Jackson, Frazer Hines excels as always with his uncanny double act of bringing his younger self and the Second Doctor to life, and Anneke Wills likewise shines with clear distinction between her time as both Polly and narrator. 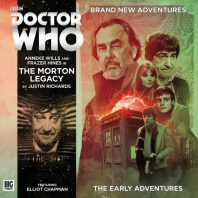 With David Sibley, Kerry Gooderson, Ewan Bailey, and Alan Blyton expertly contributing to flesh out the production and with the usual stellar direction and sound design, ‘The Morton Legacy’ ably continues this range’s remit to provide a step directly back into a bygone era of Doctor Who.